Primeval Labs Hurakan - $14.99EA! 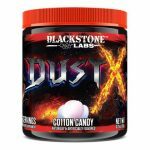 BOGO Sale Fat Burner at Muscle & Strength. Buy one Primeval Labs Hurakan and get one free for $29.99. This is currently the lowest price we could find by $34.